Fans of the 90s, get ready for a massive announcement!! Two of the defining acts of the decade, Matchbox Twenty and Counting Crows, are going on tour together for a much-requested second year in a row!! The two will come to Hersheypark Stadium on Monday 28th August 2017. 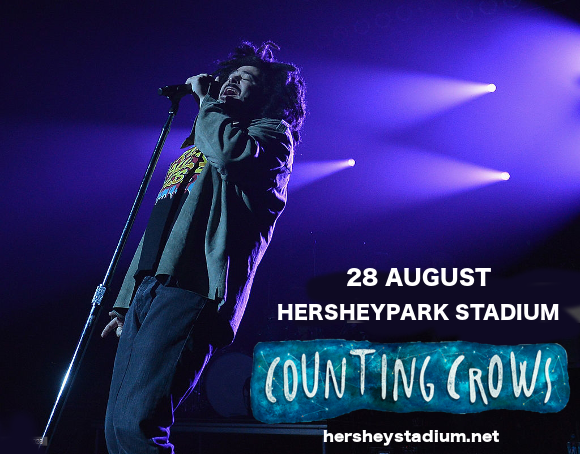 Tickets will sell out FAST for this event so don’t delay in getting yours – book your ticket to see Counting Crows and Matchbox Twenty TODAY!!! Often overshadowed by more well-known acts such as Nirvana, this show is for REAL fans of the 90s – those who remember all that actually happened, not just the trendsetters. Counting Crows’ song “Mr Jones,” the song and video for which were picked up immediately by MTV – which is funny, because the song is about a struggling musician dreaming of success. Counting Crows then had it – the band were everywhere, holding complete dominance over mainstream radio. Their debut album, “August and Everything After” went on to sell a truly incredible 7.1 million copies. Both bands last releases were a few years ago – “Somewhere Under Wonderland,” by the Crows was released in 2014, whilst Matchbox Twenty put out “North,” in 2012, suggesting that the tour, while likely to include the material, is likely to primarily be based upon the band’s earliest and best releases. From Counting Crows’ “Round Here,” and “Colorblind,” to Matchbox Twenty’s “3AM” and “Push,” fans can expect to hear all the hits that they’re desperate to experience live!! What are you waiting for?? Get your tickets NOW! !